For those who love fairytales, fantasy, imagination, this children’s book is a fabulous find. 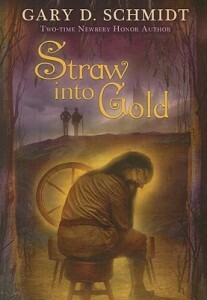 It weaves an alternative ending to Rumplestiltskin, but it is very much for older children, not wee ones. Full of drama, intrigue, and some real die-hard bad guys, we are led on a non-stop adventure that has elements of life and death, love and loneliness. The themes of family, greed, loyalty, and power are all woven seamlessly together. This children’s book is very well written, and you never quite know what will happen when the two heroes round the next bend. Yet it’s not really scary in the way that makes one cringe in fear. Rather, because the characters are so likable, we just keep on hoping it will all turn out well. I loved all the characters. The ending was very satisfying and unexpected. The surprises were many. And yes, all ends well, as most fairytales are supposed to. A timeless story easily enjoyed by ages 9 to 12, possibly okay for some 8-year-olds.